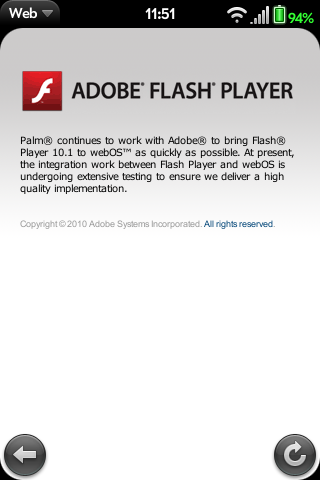 Adobe and Palm continue to work together to bring Flash Player 10.1 to WebOS as quickly as possible. At present, the integration work between the Player and WebOS is undergoing extensive testing to ensure we deliver a high quality implementation. 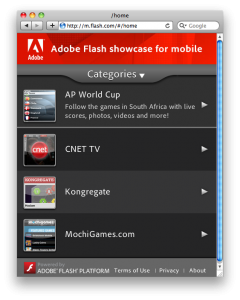 Want a preview of what you can expect from Flash on your webOS device? Well, the you should point your browser to m.flash.com. Oh, wait, you thought I meant on your phone? That’s not what I meant - go to your desktop where you’ve already got Flash installed, and go to m.flash.com. Then you can check out Flash for mobile. Thanks to @JohnLBurger, klubhead, nascar_fan, and Nathan and to our own Jonathan Ezor!